PHOENIX, AZ – According to Phoenix Police, an officer shot and killed a suspect who reportedly pulled out and aimed a handgun at the officer. At the time officers were on the lookout for suspects in a nearby convenience store robbery. 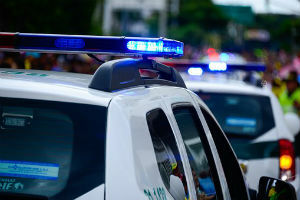 The fatally wounded suspect happened to be among a group of men seen riding in a pickup with its lights dimmed during the wee hours of Thursday morning. Police noticed the suspiciously moving vehicle with its headlights turned off and attempted to pull it over. The car did eventually stop but in doing so, multiple suspects fled from the rear of the pickup. They scattered in all directions. The deceased suspect was chased after by police. When the officer caught up with the suspect there was a confrontation. This is when he fired at and ultimately killed the alleged perpetrator. According to the police report, no officers were injured during the shooting. Also, no identities of the suspects or the fatally shot man were offered. It is also unclear if any other arrests were made. At this time, police are actively investigating whether the men in the pickup were somehow connected to the store burglary. Furthermore, the report indicates that cigarettes were stolen from the convenience store. Finally, the police will provide updates on the case when they become available.